Tobacco comes from one of seventy different commercially grown plants of the nightshade family and contains the stimulant drug, nicotine. Tobacco is indigenous to the New World, and was not introduced to Europe until the 1500s, although its use among Pre-Columbian cultures dates back thousands of years. Tobacco leaf is usually smoked in cigarettes, cigars and pipes, but is also found in a powdered form called snuff (to be sniffed up the nose) and as dip and chewing tobacco. A type of ‘wet’ tobacco leaf is smoked in water pipes called ‘shisha’ or ‘hookah’. Nicotine is also available in liquids of various concentrations and is inhaled using specially manufactured ‘vaping’ devices. Nicotine increases pulse rate and blood pressure. The effects can usually be felt immediately, and can last up to 30 minutes depending on the dose. First time users often feel dizzy or nauseous, even after just a few puffs or “drags” from a cigarette. Regular users often report that smoking reduces their anxiety and helps them relax. Some smokers say nicotine reduces their appetite, so they eat less. The average amount of nicotine in a single cigarette varies greatly. Tobacco is highly carcinogenic. Regular smokers have a much greater risk of developing lung cancer and other forms of cancer. If you choose to smoke tobacco, always smoke outdoors. Smoking indoors greatly increases lung cancer risk, as the smoke particles remain in the air for weeks or months, and are breathed into the lungs with every breath. Non-smoking spouses of indoor smokers have the same lung cancer rate as their smoking spouses. Indoor smoking also increase the cancer rate of pets living in the home. Smoking tobacco increases the risk of heart disease, circulatory problems, bronchitis and emphysema. Coughing, as well as other chest and breathing problems afflict many regular smokers. 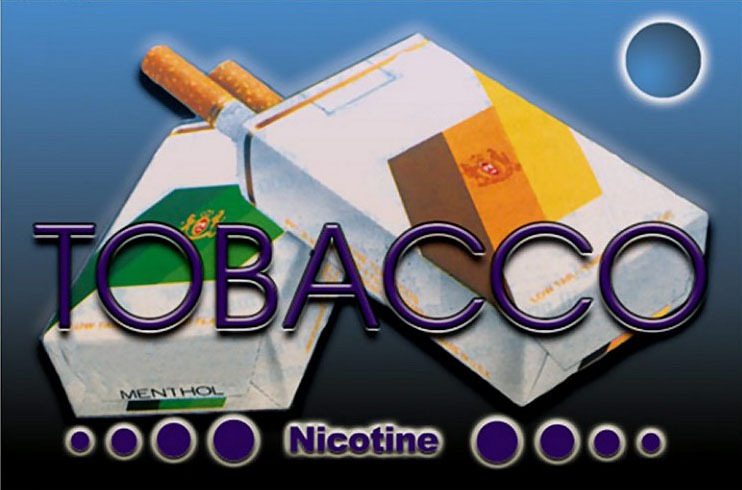 Nicotine in any form has a high addiction potential. Regular use can result in physical dependency with long-lasting withdrawal symptoms. Depression, irritability, restlessness and anxiety are some of the symptoms experienced by nicotine users in withdrawal. Smoking tobacco can cause bad breath and discolored teeth. Smoking during pregnancy can harm an unborn child, resulting in low birth weight and other complications. If you are the father of an expected child and the mother has quit smoking, it is helpful (and way cool) if you support her by also quitting during the pregnancy period. Using ‘snuff’ and ‘chew’ can also result in cancers of the mouth, nose and throat. Be self aware! If you choose to use nicotine, knowing why is the best way to maximize the benefits and reduce the risks. Although available evidence indicates that vaping is far less risky than smoking, much is still unknown about the health effects. Vape juice is largely unregulated. The ingredients can vary between manufacturers, and some contain carcinogenic chemicals. Always store vape juice far away from children. The labels and sweet flavors can attract them, and children have died after drinking the contents of the bottle. Although vaping has helped many people quit smoking, it can also result in dependency and addiction. Stay away from places where lots of people smoke. Tell all your friends and family that you are trying to quit, and get their support.